How Much Are Suspension Repairs? Suspension repairs can vary depending on what needs to be replaced. Shock absorber replacement can start at $150 and go all the way up to $600+. Some luxury and performance vehicles have electronically controlled shock absorbers, which can cost upwards of $1000 a side to replace. Suspension bush replacement can start from $100 up to $350+, depending on the component location. The suspension system on the modern day vehicle is designed to provide the driver and occupants with a smooth and comfortable ride, but also allow the vehicle to safely negotiate varying road quality and conditions. The suspension works in partnership with the braking system and tyres to keep your vehicle smooth and balanced. 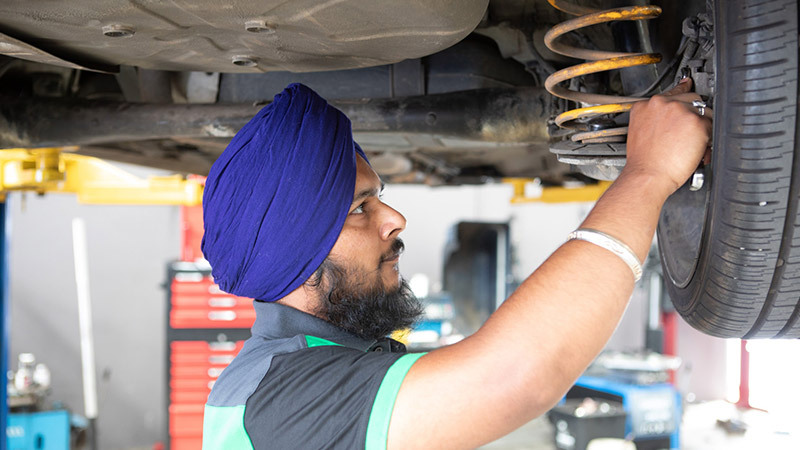 Whether you’re driving through the city or tackling a rough dirt track, it is imperative that the components that make up the suspension system on your vehicle are inspected and replaced when required to ensure you and your family are traveling safely. If you notice your vehicle feels like it is going to tip over when going through corners, you may be experiencing excessive body roll. This can make it harder to drive, slow down your ability to turn, or even make emergency maneuvers difficult. Worn shock absorbers and springs can exacerbate this issue. It is best to have your suspension system inspected to diagnose and replace worn suspension components. One of the most noticeable faults with a vehicle that has suspension issues, is when it feels bouncy or unstable. Feeling more of the road, or excessive movement after going over speedbumps and other rough surfaces, can indicate that there is an issue with the suspension system of your vehicle. If you are hearing clunking or squeaking noises when you are driving, especially over bumps, this can indicate that some of the suspension bushes have failed and are allowing components to contact each other. Suspension bushes are designed to allow a certain amount of movement in components, and tend to wear out or fail over time. Failed suspension components can also lead to uneven wear on your vehicles tyres. If you are replacing tyres frequently, or the tyres are only wearing on a certain part of the tread, this could indicate that there is an underlying issue with your suspension system. If your vehicle is parked on level ground, but you notice that it is siting lower on one side than the other, this can indicate spring or suspension failure. In this case, it is advised not to drive the vehicle, as steering and braking systems may be compromised. Our mechanics will carry out a thorough suspension inspection, including all bushes, shock absorbers and other components. They will also road test the vehicle for any abnormal noises or excessive body roll. The tyres will be inspected for any uneven wear, and a quote will be provided for repairs or replacement of components, if required. Once the cause of the fault is determined, the parts will be repaired, or replaced if required. The vehicle will be road tested to ensure correct operation has returned, and a wheel alignment will be carried out, to reset the alignment back to factory specifications. If you notice any of these symptoms, have your vehicle inspected by one of AutoGuru's 1,600+ qualified workshops, or have a fully certified mobile mechanic come to your house or office – Too Easy! All data gathered in September 2016.